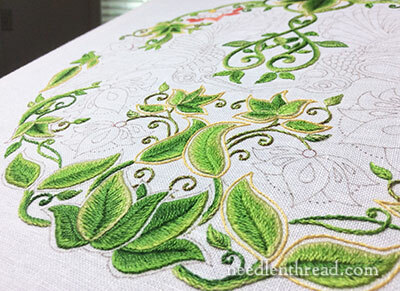 Secret Garden Embroidery: The Green is Finished! It doesn’t really work rhythmically with the song, except in my own tuneless, rhythm-less way of singing. There it is. Green. Finished. I still need to finish up some yellow outlines, and I need to remove some old dark green outlines stitched in a while ago and replace them with yellow. But, when it comes to the intense stitchery, the leaves are, for all practical purposes, finished. Here are the last leaves, closer. It’s funny how, in photos, the leaves look completely different, depending on the angle of the photo. Some leaves that aren’t really all that dark, look very dark. And some leaves that aren’t all that light look very light. In any case, the leaves are finished. 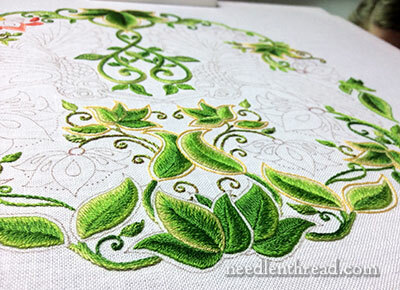 The next immediate step is to finish the outlining in yellow around all the leaves, and then…the Flowers! And now that the leaves are done, I feel a little more comfortable dabbling with some variations with different threads. 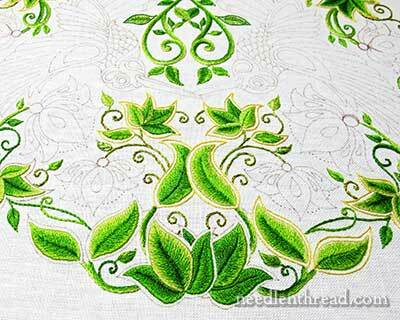 Do you remember, I spoke of doing a silk version, a whitework version, possibly a goldwork-excerpt version? Well, the scope of the project is really quite huge, and to undertake it three or four times is probably a bit insane. Still, I have plans to play with other mediums and techniques, at least with parts of the design. I want to try something somewhat weird with a silk version. And I want to dabble with a bit of whitework, too, so that we can see more clearly how a design can be interpreted in so many different ways with embroidery. Don’t you just love embroidery? There are ever-so-many possibilities with hand embroidery, that you could never, ever get bored with it! Right? I’m watching this project from the beginning. How beautiful! It looks beautiful, Mary, and I will be interested to see the other versions as well. I do have a question, however. Having never worked with silk threads, what would be the best way to start? Should I purchase a kit, or just try a simple design? Any advice would be most appreciated. How I admire your “stick-to-it-ness”. ….and then to plan to do it again in another technique.! I’ll be interested to see your whitework interpretation, I’d be more likely to try that. Mary, it looks so wonderful! Those colors are so spring-y, and the yellow really works wonders. I remember seeing a few different stitches on a few leaves earlier, but I can only make out long and short stitch on this page. Did you remove the other stitched leaves and go with long and short on everything? Congratulations for finishing the green leaves. The green in the photos look so beautiful and lush it really does look springy. It will be interesting to see what you do with the weird silk version and other mediums and techniques. I can’t wait to see what you come up with in terms of the colours, threads and styles for the rest of the design. As you say you can there are so many possibilities you can never get tire of embroidery. Yes, I DO love embroidery! The green is just loverly. To call it beautiful would be an insult. This is something that should be treasured by your family for generations to come. That is so lovely, Mary; the yellow outlines are just right! I have learnt so much from your website and daily news, it’s given my imagination such a boost! Many, many thanks. Congratulations! The green leaves really looks different, on the photos the bottom part leaves are adrker than the top leaves. Thank you for giving us the opportunity to see how the work progresses! It was a learning experience to read and watch! So beautiful Mary. I so agree with your last comment about the possibilities of hand embroidery. ..and I am just a newcomer. A lifetime too late alas, but making the most of the now! Lovely! Yay! This piece is stunning! And I am learning so much from you, even in how to think about the choices available. What about Mountemellick? Easier for my attention span and I’ve been wanting to try that technique. Perhaps just a pattern? Maybe I’ll try it, but I have two other projects up first. The leaves look wonderful. I am almost finished the small leaves. I am looking forward to having all the green finished too! I have too many other distractions, not all needlework unfortunately. Thank you for your inspiration, I enjoy your news each day on so many needlework subjects. Lovely work … congratulations on completing the leaves! I look forward to seeing the flowers come to life. Wow, it looks so cool with just the green done. 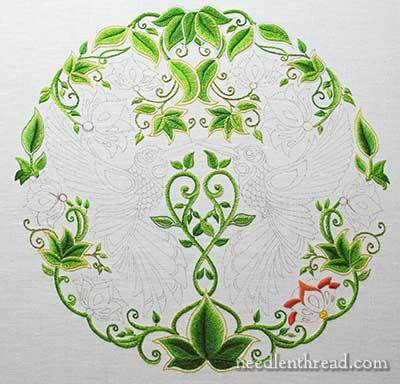 I can’t wait until you get to the white work version because that is my all time favorite kind of embroidery and as I love silk, I may use that and kill two birds with one stone! Mary, Not finished yet, and already simply stunning!!! IT is really merveillous, beautiful, extraordinaire.Work remarkable. Grande félicitation,yes can be Happy ! Wow! I love this project!! Congratulations to end with the green! I’m thinking in crewel wool, and of course I bought the book! Although I do not write much, I often visited you and sometimes I step in the early morning (3am or so) with my accomplice Ipad for to read your blog and I enjoy a lot!! !